The 19th Bladesman is an intriguing and emotional fantasy novel that lays the foundation for more epic stories to come. 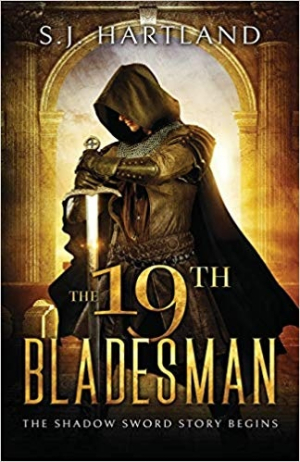 S. J. Hartland’s The 19th Bladesman is a coming-of-age fantasy novel that explores loyalty and love through the lens of a young warrior. In a mystical world of magic and kings, humans and gods battle for power, and death is a temporary state. Kaell is a hardened teenager, bound by magic to the god of war and trained by his lord Vraymorg to kill ghouls, enemies who threaten all of the lands. While kings argue over territory and war begins to brew, Kaell navigates scheming men, jealous gods, and dangerous women to choose between humiliating survival or honorable death. Though Kaell’s life is that of a supernatural warrior, he struggles with familiar and relatable teenage problems like rebellious inclinations and pretty girls. Kaell and Vraymorg’s relationship is the heart of the story; all of Kaell’s motivations and behaviors are tied to his complex and dramatic feelings for Vraymorg. Kaell’s inner monologue is an effective window into his emotions, keeping him likable and sympathetic even as he engages in brutal and violent acts. Kaell has a habit of speaking in poems, an endearing quality that adds dimension to his character. Vraymorg is a mysterious man whose history unfolds throughout the story, maintaining interest: like Kaell, he struggles with his emotions in a culture that prefers stone-faced warriors and that has a history of heartbreak. Subplots focused on Vraymorg deal with themes of family love and vulnerability. Supporting characters are abundant and well-developed, if their intricate histories and similar names make it difficult to track them all. Women characters are less developed, usually functioning as priestesses or involved in sexually manipulative schemes, and some frustration related to gender roles is expressed. Natural and humorous dialogue adds levity to the book’s savagery and drama. While it is difficult to picture the novel’s world in its entirety, individual locations are captured through environmental descriptions of mountains and islands as well as through structural details of elaborate castles. Accents, ligions, and fashion styles are all mentioned and help to make the book’s fantasy lands feel real. Elements of magic are not fully explained. The writing style is striking and poetic, full of imagery and sensory details. Dreamlike descriptions of lavender-scented fields, warm fires flickering against cave walls, and the sound of twigs crunching underfoot have an effortless feeling. Narrated by multiple characters who provide their own information and perspectives to the unfolding events, the story’s transitions are clear, though some characters are neglected for long periods before they reappear. Shifts into the past are common and always essential to the plot. Well-paced and punctuated by imaginative, graphic fight scenes, the book slows during its middle, and scenes of capture and torture become repetitive. By the end, Kaell and Vraymorg’s emotional narrative is brought to a satisfying resolution, while many questions and plot lines are left open for a sequel.